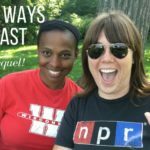 Welcome to the first full Four Ways podcast episode! 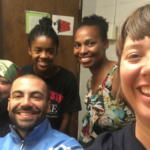 Stacy Harbaugh and Kira Stewart sat down with members of Madison’s Urban Community Arts Network in July to discuss the extraordinary work this local hip-hop advocacy nonprofit is doing in our community. Throughout the discussion, we talk about UCAN’s origins and mission, their focus on community building and professional development for hip-hop artists, and how their nonprofit takes on innovative projects like bringing hip-hop into the classroom to teach students about climate change. We also took a deep dive into how the group has been working for years to improve relationships with local government, music venue owners and even university researchers to dispel the often perpetuated myths around violence at hip-hop shows. It’s a case study in perseverance to purpose and a commitment to democracy and grassroots organizing. Visit the UCAN website for more or check out their Facebook page for their latest news. This is the full conversation, but we shared segments on WORT’s Local News. Find them all by clicking on the Four Ways tags at the bottom of this post. Four Ways is a new project that gets local leaders to describe four ways they are making a meaningful difference in our community. The stories will change, but the heart of the Four Ways commentaries is to talk about real examples of making progress for equity, inclusion and justice.